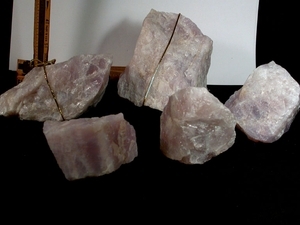 Parcel group of rare lavender rose quartz rough from a California mine closed in 1997. Lithium inclusion in addition to titantium, iron and other impurities turns 'normal' rose quartz to this variety of lavender to orchid shades. Keep all of your quartzes out of the sun and fluorescent lights to preserve their natural hues.